Hakodate Kolsch is a 5% kölsch style beer from Hakodate Beer, based in Hakodate, Hokkaido. It’s based on a traditional receipe from Cologne, Germany and it is part of their all-year round range of craft beers and can be found in both bottles and on draft. Moreover, Hakodate Kolsch is also known as Kita no Yakei, or The Northern Night View in English. Run of the mill kölsch style beer, which isn’t a bad thing. Hakodate Kolsch poured out a cloudy, muddy red colour with a fair amount of crisp, white head on top that quickly dissipated into a thin ring around the side of the glass. It had a pungent aroma of dried fruits, such as raisins and plums, with a distinct hoppy quality to it that shielded some caramel aromas from the malt. A lot going on in one glass but it was the malts that lingered the longest on the nose. It continued with the malt-forwardness in the body with the caramel tones being the dominant flavour over the rest of the flavours. There was some hints of dried fruits in the body along with some bitterness from the hops too, though the star is the malt. 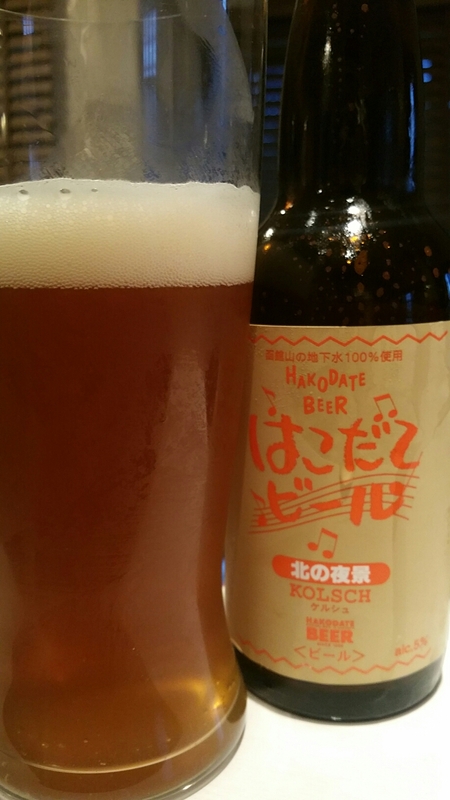 As Hakodate Kolsch warmed up, it became a tad too sweet for my liking, and eventually a bit cloying. It finished off with the sweetness in the malts being balanced with the hops bitterness in the end. Hakodate Kolsch is a run-of-the-mill kölsch – not a bad thing if you’re looking to get into the style but nothing spectacular either.